Stop fooling yourselves about the wonderful "democracy" evolving in Egypt. Nazis or Stalin: What will Egypt choose? Assuming the Egyptian people actually had a choice at this point, what options do they really have to select from? At present, their choice is like having to choose between the Nazis or Stalin - between the Islamic fundamentalists of the Moslem Brotherhood vs. the iron-fisted dictator Mubarak. Not a great option in either case for the Egyptian people. But do the Egyptian people actually have a choice? The reality is that the only choice they got was to demand change. As to what change they'll get, that's in the hands of those who had previously organized, waiting for this day to come, and in those who hold the power today. If ElBaradai takes over tomorrow, it won't have been through democratic elections, that's for sure. And there would be no guarantee of democratic elections in the immediate future either. 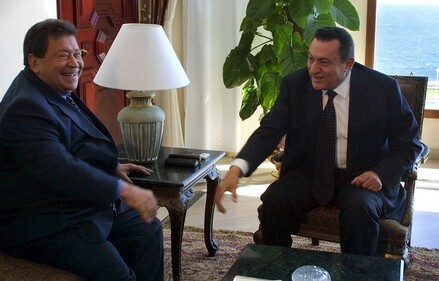 But I would not take it as a 100% given that Mubarak is completely down and out. If I were Mubarak, and I cared about the future of Egypt (and as Egypt is his life's work, I assume he does), he would be doing everything right now to make sure that the Moslem Brotherhood aren't in a position to take over the country - an act that would turn Egypt into Iran and Gaza. Mubarak would be taking steps to weaken their influence and growth. While it will now be impossible to lock the Moslem Brotherhood out, it is still possible to marginalize and minimalize their influence. Mubarak would publicly announce that elections will be held in 6 months under international supervision and management, and that he is asking the UN to send in those observers immediately. Mubarak would announce that he is retiring in 3 months time, and he is staying on for those 3 months solely to ensure that preparations for elections are complete and that laws are in place for democratic elections every 5 years. His goal would be to first calm down the street and make it clear and transparent that he has set up the irrevocable mechanisms for transition to a democratic government. His second goal is to give Suleiman a fighting chance. The way he will do this is is ensuring that the widest number of parties can run independently and get elected. This will hopefully weaken the possibility of the Moslem Brotherhood gaining too much individual power. His third goal is to scare the people once the street has calmed down. He must force them to consider if they really want to vote Moslem Brotherhood and turn Egypt into Iran. Calming the street down is important. Once the people see they are getting what they want and are given the time to think, that will block the immediate ascension of the Islamic fundamentalists. The Moslem Brotherhood may still win the elections in 6 months time as they are the most organized, but 6 months give others a chance too. Tomorrow the Moslem Brotherhood could control everything - without elections. But in 6 months time, they would be an important party, but not necessarily the ruling one. The Egyptian people don't need to have to choose between the Nazis and Stalin, but will if they aren't given the chance to calm down and think about what they want for their future. ElBaradai and Muslim Brotherhood are counting on them not having that chance to think. Some of today's tidbits from a collapsing Egypt. 1. Glad we gave the Sinai to Egypt -- the US guarantees for a demilitarized Sinai don't seem to be working. "Jerusalem - Israel said Sunday it was watching developments as Egypt moved military forces into Sharm el-Sheikh, but declined further comment. Foreign Ministry spokesman Yigal Palmor, contacted by the German Press Agency dpa, only said Israel was following and checking the media reports about the development. But in following the Israeli government line about developments in Egypt, he declined further comment. 2. Tens of thousands continue to riot in Cairo...Foreign Minister flees under heavy fire. Former Egyptian Interior Minister Habib El-Adly was evacuated from the Interior Ministry Building in Cairo under heavy fire, Al-Jazeera reported Sunday afternoon, despite the authorities' attempt to shut down the Qatari network in the country. Egypt said on Sunday it had shut down the operations of Arab satellite broadcaster Al-Jazeera, which according to the authorities had encouraged the uprising in the country, in an attempt to restore order. 4. IDF building emergency fence to block roads coming in from Egypt. No sitting on the fence: Red Division's engineering prepares to block the first of a number of roads on the international border with Egypt. The first roadblock, set up as a pilot, will soon be build via the combined forces of the engineering department (desig), Field Engineering Command, Eilat's IDF Control Center and the IAF-Israeli Air Force. The model was built by civilian officials, with planning and building lasting only two weeks. The Division is being tasked to seal roads in problematic Eilat IDF Control Center sectors. The first point to be blocked is considered a "hot" sector, due to multiple infiltrations at that location. For example, this point was infiltrated by a Palestinian terrorist in 2007, who attacked civilians. 5. As Egypt hunkers down, Al Jazeera reports that Hosni Mubarak is planning his getaway. Not to Europe, England or the USA. Al Jazeera believes he's on his way...to Tel-Aviv! You don't have to believe it (after all, it's from Al-Jazeera), but take a look at the faces of Mubarak's good friends from Israel's Labor and Kadima parties. Fuad "Binyamin" Ben-Eliezer promised us last week that his good friend Mubarak was in total control of his country (and that Mubarak cares about his people). And don't forget Labor Leader (oops, aren't they now called the "Independence" party?) 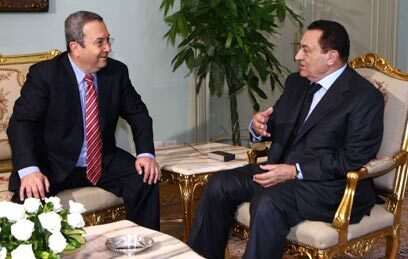 Ehud Barak with his close friend Mubarak. Don't fool yourselves -- this is exactly what we can expect from Abu Mazan in the Palestinian Authority...and unstable regime with a peace treaty not worth the paper it's signed on. 6. Last but not least...Globes is reporting that the Iranians are blaming the entire destabilization demonstrations in Egypt...on Israelis vultures and sharks? Nope...Israeli command units. "Israeli commando forces came to Cairo in order to create tension and unrest in the city," he distributes today (Sunday)'s official news agency of Iran's Islamic Republic. Information sources to IRNA reported that the appointment of Egyptian Intelligence Chief Gen. Omar Suleiman, whom they call the main negotiating with the Zionist regime, the deputy of President Mubarak, shows in fact that Mubarak gives green light to the Zionist regime to intervene in local events in his country. " Eyewitness to the Iranian news agency said on the phone that "he saw suspicious attacks on commercial and residential places and killings by people suspected of Cairo which created uncertain conditions in the country." Witness referred rumor that Israeli agents integrated into the crowd to lead the public protest turned violent civil conflicts. 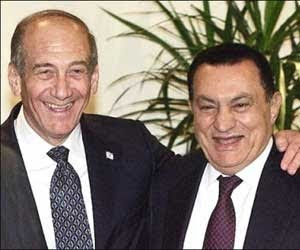 Several witness that when his contract with a number of American and Zionist leaders in the last 24 hours, President Mubarak warned that toppling his administration will pave the way for the "flow of oxygen" to Israeli rule. Meanwhile, Zionist officials have expressed strong support for Mubarak's dictatorial regime and believe that the possible collapse will lead to further isolation in the Zionist regime" was written. Here at the Muqata, we've haven't hid our disgust at the state of dictatorships that permeate the Arab world such as in Egypt, Jordan and the Palestinian Authority. We haven't hid our hopes that the Arab people would rise up and replace these tyrannies with true democracies. "we share in your dream of breaking free from the shackles of your little dictator and his occupation government". We've demanded freedom (and freedom of speech) for Egyptian bloggers imprisoned by the Egyptian regime. We helped publicize the Egyptian government's crimes against Humanity. But in the same vein we wrote a serious analysis when we raised the question as to which would be better, a dictatorship that won't attack Israel, or another Islamic state that will? Years ago we were already discussing what would happen after Mubarak exits the stage. The less practical Islamists are poised for a takeover of Egypt. What happens when the dictators who love Jihad and are aligned with Iran replace the dictators who first love personal comforts, prestige and lining their own pockets? And it was this past summer where we talked about the upcoming coup against Mubarak's government. 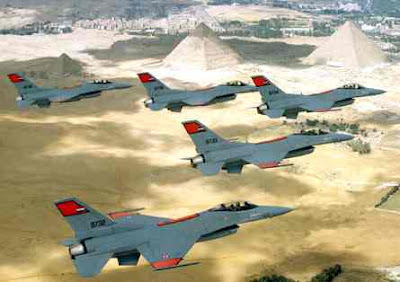 Furthermore, it is only a matter of time before the Islamic Brotherhood attempts a coup against US-propped up Egyptian government once Mubarak dies, and gains access and control to all of Egypt's advanced US weaponry. And as we wrote the other day, the problem in Egypt, like the other Arab states is that democracy is not likely to take over, as much as we'd like it to. Elbaradai is supported by the Muslim Brotherhood and in fact, Elbaradai supports the Muslim Brotherhood. "We should stop demonizing the Muslim Brotherhood," he writes. Elbaradai is also personally responsible for Iran's unhindered progress in their goal to obtain nuclear weapons and commit genocide against the Jewish people. In short, an Elbaradai/Muslim Brotherhood government would mean another Hamastan, but an Islamic state with the largest army and the second largest number of F-16s in the Middle East. The other likely alternative is that the Egyptian military takes over. A more stable situation for Israel, but still a ticking time bomb on the inside. It comes down to this. There is no tradition for democracy in the Arab world, and I'm having difficulty envisioning it flourishing in Egypt. I see the Islamists taking over - through the facade of democracy. But most importantly, this should be a serious warning bell for all of us in Israel. The Israeli Left eagerly supports dictators like Abu Mazen and Yasser Arafat. They run weekly protests against Israel, but yet not a single one demanding elections or democracy in the Palestinian Authority. (Talk about hypocrites). So while the Left and the West pressure Israel to make peace with the dictator Abu Mazen no one is considering the consequences. Abu Mazen is far weaker than Mubarak. It is only a matter of time before he is overthrown by Hamas (not democracy). And what happens the next day? Israel has given over control of more of the Land of Israel to our Islamic enemies (instead of our dictatorial enemies). They will have access to all the tanks and missiles that Saeb Erekat said he plans to bring in. Watching what is going on in the Arab world, can anyway honestly say this 'peace process' with the current regimes in place, sounds like a smart long-term idea? Racist is the first word that comes to mind when viewing photos and videos of the Arab/Leftist protest in Jaffa against Jewish people. 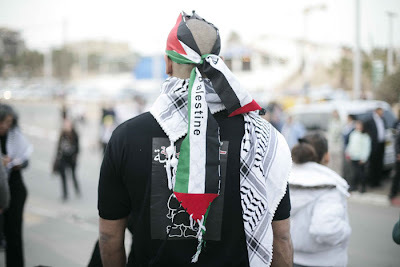 The protesters have tried to hide behind the mask of post-Zionism by calling "Jews" "settlers". Meanwhile the protesters yell "Allah Hu Achbar" and "Jaffa Jaffa Arabiya" (Jaffa is Arab) proving that in reality it is nothing more than a protest against Jewish people living in Israel and Jaffa specifically. It is also clear that certain people are trying to stir up the local Arab populations and spread the chaos of the Arab world into our country. But since we have democracy here, the only direction they can be trying to take it to is Islamification. But at this point, we've come to expect nothing less from Israel's fifth column - our radical and very sick left. Photos of the protesters from Walla. 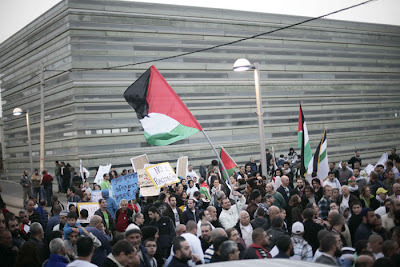 Note that this Nationalist (and racist) protest against Israel is taking place just south of Tel Aviv. Last week the Arabs of Arak Burin claimed that Settlers came into their town and shot up some "kids". Like always the Arabs and their Leftist friends participate in their Culture of Lies. On Friday we reported what really occurred. And here is the corroborating video. In this video from an IDF security camera you can see the lone pedestrian (presumably a Jew) being attacked by the Arab terrorists who are stoning him. The pedestrian tries to get away, but one Palestinian terrorist with the stone follows him and is determined to kill the pedestrian. Only when the pedestrian fails to get away does he shoot the terrorist - clearly self-defense. Yet another lesson in why one shouldn't be so quick to believe the Arabs or Leftists when they talk about "Settler violence". 10 waffle points to anyone that can tell us where this secret entrance to the Muqata ? So the Arabs have been claiming that Settlers (multiple) marched into their town and shot and killed an innocent Palestinian "boy" from the town of Arak Burin. But after the fraud of Jawaher Abu Rahme of Bil'in was exposed, the press isn't going all vigilante and taking the Palestinians at their word and blowing up the story into something it wasn't. And it's a good thing they didn't, because the police have uncovered so many interesting details that the Arabs didn't want anyone to know about their blood libel. The 19 year old man who was killed by a civilian, wasn't innocent. The man and his gang had surrounded and attacked a pedestrian walking near Yitzhar, stoning the victim with rocks. Omer Maher Qadous (or alternatively Udai Maher Qadous) then approached the man with a stone in hand to apparently smash him with it at close range. The civilian, who's identity is still unknown, then tried to push the Palestinian terrorist away and shot in the air. Only when he failed to stop the approaching attacker, did the man then shoot this Palestinian terrorist with one shot. How do the police know what happened? First of all, one of the Palestinian attackers talked. Unfortunately for the Left, the second is that there was an IDF security camera in the area that got the whole thing on film. (Sorry, no new fake martyr for you today). Blood libel: Arabs claiming rampaging settlers shot and wounded two innocent Palestinians (killing one). Truth: An organized group of Jewish hikers near Bat Ayin (Gush Etzion) were stoned and shot at, and then the tour groups security guards fired back at the source of the attack killing one of the terrorists and wounding the other. Background: Two nights ago shooting was reported on Highway 60 at "Tzomet HaGush" junction in Gush Etzion. Also, 8 members of a 13 member Palestinian Terrorist cell from the Bethlehem area were captured. The cell was responsible for killing 2 tourists who were hiking and wounding others. What's going on in the Arab/Islamic world is fascinating. With all the riots and coups it can get so confusing as to which governments are in and out, which ones are on the way out, and what direction these countries are headed. To help me keep it straight (and I'm still not 100% sure I got it all right, except the last one), I made a list of the major countries facing internal threats from anti-government forces, organizations, and movements. Tunis. Government is out. Islamists in power. Islamists will probably keep power. Lebanon. Government is out. Islamist in power. Islamists will probably keep power. Egypt. Government appears to be on the way out. Not clear if Islamists, Military or Democracy will take hold (OK, who am I kidding with that last line). Jordan. Government still in charge, but for how long? Palestinians likely to take over if riots escalate and overthrow government. Palestinian Authority/Gaza. Government is out. Islamists in charge. Likely to stay that way. Palestinian Authority/West Bank. Government likely to be toppled soon. Islamists will take charge. Iran. Government (Islamists) in charge. Green movement crushed. Iraq. Government stabilized by US forces. Chance it will fall after complete US withdrawal. Islamists would then take over. Sudan. Divided. North Sudan is Islamic. South Sudan is not Islamic, but in a precarious position. Unclear how long South Sudan can survive. Yemen. Unclear what will happen, except that it's guaranteed to remain radically Islamic. Saudi Arabia. Government (Islamists) in charge. Likely to stay that way. Israel. Government stable. Democracy. Not Islamic. Likely to stay that way. Feel free to post your comments, additions, or corrections. Media ban lifted: IDF Radio (Galei Tzahal) Reports: Palestinian terror cell captured in Beitlechem/Hevron area. Gang was responsible for murder of American female tourist (Christine Luken) last month. The Palestinian terror cell was also responsible for a murder last year of Neta Blatt (also near Beit Shemesh). 8 cell members captured. 5 still at large. In addition to these 2 murders, this Palestinian terror cell was responsible for dozens of other criminal activities against Jews. Wilson was found with her hands bound and several stab wounds to her chest and back. Logan's body was found several hundred meters from the road between Mata and Beit Shemesh. The suspects were arrested on December 21 in a joint IDF-Shin Bet operation and during their interrogation confessed to perpetrating the attack and reenacted it in the field. During their interrogation, one of the suspects, Kafah Animat, confessed to another murder last February of Neta Blatt, a teacher who was found dead near Beit Shemesh. The suspects also confessed to perpetrating additional stabbing and shooting attacks with the declared goal of murdering Jews. They were not believed to have been affiliated with an organized terrorist group. Shin Bet sources said that the suspects succeeded in entering Israel through gaps in the security barrier near the settlement of Beitar Illit south of Jerusalem. They said that the suspects confessed to planning the murder of Logan that day. “They decided they wanted to kill someone that day,” a Shin Bet source said. During the struggle, Wilson succeeded in stabbing one of the suspects in the arm with a small pocketknife she carried with her as a tour guide. This enabled the Shin Bet to identify one of the suspects, who was imprisoned in Israel in the past in Israel, to Logan’s murder through DNA samples that were found at the scene. During the reenactment of the murder, the suspects led the investigators to a backpack in which they had placed the cash, keys and cellular phones. Wilson, who was stabbed in the chest, pretended to be dead and was able to fool the attackers who then left the scene after killing Logan. She then walked 400 meters barefoot, with her hands tied behind her back and a blindfold on her eyes until she reached a parking lot where she was found by other hikers. Animat, one of the suspects who was involved in both murders, said that after the assassination of Mahmoud al-Mabhouh in Dubai in January 2010 – attributed to the Mossad – he decided to avenge the attack and stabbed a couple near Beit Shemesh and a few weeks later opened fire at an IDF patrol near the Gush Etzion Junction. The suspects also confessed to committing a string of burglaries in the Beit Shemesh area. Kuttab goes to bat for PA President Mahmoud Abbas, explaining what a great guy he is. "Palestine television, which falls under the president’s powers, was totally revamped and cleaned of anti-Israeli incitement." Cleaned of anti-Israeli incitement? Only if you don't count the Arabic broadcasts on Palestine TV. Here's an example of their "cleansed" programming from only a few days ago. More examples can be found here at the Elder of Zion. Remember: Just because it's in the NY Times doesn't make it true. Israeli and Western media are trying to downplay the threat of the riots in Egypt, and this morning on IDF radio, Labor party senior member, Fuad Ben-Eliezer spoke about his good friend, President Mubarak, and how he can't imagine that the riots would threaten the stability of the current regime. You have to wonder why Fuad is such "good friends" with a corrupt leader. More on the riots in Egypt, Lebanon, and the PA later today. Al-Jazeera released a selection of documents that were apparently leaked from someone on the Palestinian side. The documents apparently represent the Palestinian's view of the various negotiations with Israel over the past 20 years, with emphasis currently on the most recent Olmert-Livni/Abbas-Erekat negotiations. We'll be examining the material and explaining it throughout the day. Assuming the documents are real and unmodified, the most obvious question is who released it, and whom were they trying to hurt (or help) by doing so. Update: Olmert's spokesman confirms many of the details of the agreement as mentioned in PaliLeaks, but adds that they (Olmert and Co.) still don't understand why the Palestinians turned it down. Palestinian terrorist approached an IDF checkpoint earlier today near Mevo Dotan with his donkey. He yelled Allahu Akbar, pulled out an AK-47 and started shooting. For some reason the IDF then fired warning shots in the air, and only then fired to kill the terrorist. The IDF unit that neutralized the terrorist was the 97th Battalion (Menashe Regional Brigade). Unconfirmed sources link this terrorist to another attack based on his family name, but no confirmation of this has been made possible yet. Wonderfully amusing CNN video came out today about teargas in Tunisia. It's not a story about the Tunisian riots, but more about the CNN staff's experience with teargas. In the story the reporters are joking about the tear gas, they're describing its effects. There going back into the the clouds of it. They actually seem to be enjoying themselves overall. In the video you see people coming out of massive clouds of teargas. No one dies of course from the tear gas, just like no one died in Bil'in despite what the Useful Twittiots still like to claim. And speaking of Bil'in, we'll have some new and interesting news for you hopefully soon as the army has just completed its investigation and determined that what's her name, oh yeah, Abu Rahma, died from being treated with the wrong medication (overdose of Atropine) in the hospital, and that she was indoors, not near the demonstration. But more on Bil'in and their Useful Twittiots another time. (4:35) "Barry, Ben and Mary have been gassed enough to talk about the difference betwen the tear gas in Tunisia versus let's say the West Bank and Gaza. Having savored the West Bank style I can tell you that it's very choking, but theirs [Tunis] sound particularly nasty." There you have it. CNN declares that Israeli tear gas is not the worst in the world. The radical leftwing organization "Yesh Gvul" petitioned Israel's High Court today, demanding the Supreme Court interfere with the appointment of the IDF's next Chief of Staff, General Yoav Gallant. Yesh Gvul's attorney Yiftach Cohen charged that General Galant should be deemed as "unworthy" of the appointment because he "is suspect of war crimes committed during the IDF Cast Lead operation." In response, Justice Asher Gronis sarcastically replied, "Perhaps we should appoint Judge Goldstone as the next IDF Chief of Staff?" I'm glad someone on the Supreme Court sees Yesh Gvul for what they are. 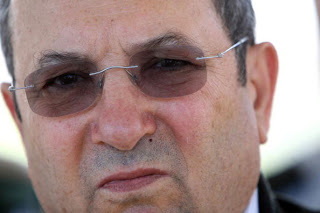 Dropping a political bombshell, Labour Party Head Ehud Barak announced Monday morning that he and 4 others from the Labour party intended to split from Labour, and would create a new party -- tentatively named, "Atzmaut" (Independence). The background for such a move is very clear. For months left-leaning MKs in the Labour party have been castigating Barak for not bolting from the government, due to "a lack of positive movement" regarding negotiations with the Palestinian Authority. Barak holds his position dearly, fully knowing that being Defense Minister in a Netanyahu government is the best he can possibly hope for, and he therefore orchestrated his split from the Labour party. Now, Barak can safely stay in his Defense Minister position without being criticized (from within his party) for remaining in the government. Reports indicate that PM Netanyahu was fully aware of this plan, and he guaranteed that Barak and Deputy Defense Minister Matan Vilnai would keep their positions. Netanyahu doesn't even have to fire the remaining Labour government ministers (who criticize him daily), as they will be resigning on their own. The government is now slightly smaller, yet has gained more stability. The opposition will grow louder, but their effectiveness is still close to zero. Final thoughts: I don't think the earthquake has finished...and we will probably see more political aftershocks in the coming days. Additional disenfranchised Labour MKs might also split and move to Kadima, furthering neutering the remains of the Labour party. Ehud Barak's done a great job at destroying Jewish community outposts over the past 2 years, so it's only fitting to see him do another hatchet job on the Labour party. Nu, Flip the Switch Already! The Daily Telegraph Reports that Russian scientists providing technical support to Iran's Bushehr nuclear reactor, are considered that activating the reactor, could cause a meltdown on the scale or the Chernobyl disaster. The scientists, "..have raised serious concerns about the extensive damage caused to the plant's computer systems by the mysterious Stuxnet virus, which was discovered last year and is widely believed to have been the result of a sophisticated joint US-Israeli cyber attack." Ali Akbar Salehi, Iran's foreign minister who also serves as head of the country's Atomic Energy Organisation, rejected suggestions earlier this month that the Bushehr opening schedule should be postponed. "All the rumours related to the Westerners' claims that Stuxnet had caused damage to the nuclear plants are rejected," he said. However, Russian scientists working at the plant have become so concerned by Iran's apparent disregard for nuclear safety issues that they have lobbied the Kremlin directly to postpone activation until at least the end of the year, so that a proper assessment can be made of the damage caused to its computer operations by Stuxnet. The Iranian government is bitterly opposed to any further delay, which it would regard as another blow to national pride on a project that is more than a decade behind schedule. While Western intelligence officials believe Iran's nuclear programme is aimed at producing nuclear weapons, Iran insists the project's goals are peaceful. The Russian scientists' report to the Kremlin, a copy of which has been seen by The Daily Telegraph, concludes that, despite "performing simple, basic tests" on the Bushehr reactor, the Russian team "cannot guarantee safe activation of the reactor". It also accuses the Iranian management team, which is under intense political pressure to stick to the deadline, of "not exhibiting the professional and moral responsibility" that is normally required. They accuse the Iranians of having "disregard for human life" and warn that Russia could find itself blamed for "another Chernobyl" if it allows Bushehr to go ahead. Go ahead guys and flip the switch already. It's only a few wimpy, simple, basic, safety tests. The Israeli Northern Branch of the Islamic Movement, led by Sheikh Raed Salah, is now demanding the removal of all "Mezuzot"** on the gates of Jerusalem's Old City. 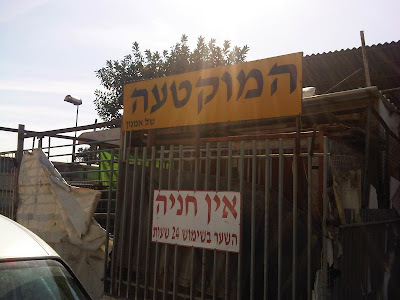 According to the movement, the mezuzot are an attempt to Judaize the "Arab heritage" of the Old City. In a statement issued by the movement, it stated that during a patrol in the Old City, they saw mezuzot on the various gates, and Jews touching the mezuzot as they passed through the gates. are called up to to act quickly to remove the mezuzot." On a personal note, I remember the first time I passed through Sha'ar Yaffo -- the Jaffa Gate, and saw the large mezuza on the gate. 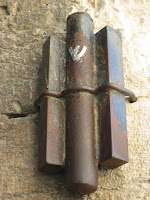 Nothing is more appropriate than a Mezuzah on the gates of the Old City of Jerusalem. What could be more appropriate for a "New Israel," than the Old City of Jerusalem, without any mezuzot? Long time readers of this blog know that the Muqata Blog and the Israeli City of Modiin don't see eye to eye on many issues. Be it their (alleged) call for Merriful Christmas Carolling in their public parks, to forbidding Jewish students from donning tefillin, to facing the wrath of the Modiin Moderator (though in all fairness, I have found many community list moderators are just as fanatical and vengeful), Modiin is a brash city that doesn't hide from controversy. The latest one to have caught my eye is an ad campaign going on in the Modiin shopping mall. 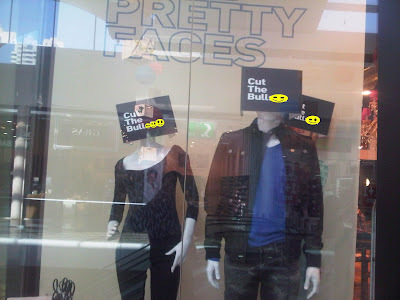 Ads for the "Lee Cooper" jeans store advertise their jean-clad mannequins with signs proudly stating; "Cut the Bulls***"
I'm not surprised by a vulgar language ad campaign, as its rather sadly typical. What I found sadly amusing was the back and forth on the Modiin email list, and the attacks on the people who dared to question the ad placement in a public mall. I think the point is that everyone has a different definition of what is "distasteful".We should all "live and let live" unless it is a matter of life and death, no? Many of us came from the intolerance of Jerusalem to a more tolerant Modiin (hopefully). Can you all stop being such prudes and concentrate on more important issues that can make this a better place!! Freedom of speech and ideas are paramount in a democratic society. Don't infringe on my speech and I won't infringe on yours. The bottom line is that a loud cacophony of Modiin's secular society believes there's absolutely nothing wrong with exposing children to vulgarity, and they honestly believe that any opposition to it is based solely on religious objections. Foul-mouthed language is crass, crude and poor manners. Modiin's residents "left the intolerance of Jerusalem" so they can freely expose Modiin children to foul language? As opposed to more civilized Western societies who know how to value "proper" speech, Modiin would rather expose children to everything and talk like a toilet. Since sensitivity to exposing children to foul language makes one a "prude," why stop there? Without any yardstick for decent behaviour (and challenging it makes you a religious, fanatical prude), what's to stop Lee Cooper from showing unclothed models as well? I'm sure the enlightened Modiin hedonists would find this example from a USA Public School, "religious coercion" -- its just a shame they are too wrapped in "targeting the religious" than to realize how embarrassing (and foul) their own behaviour is. ALBANY -- South Albany High School to students: Sticks and stones may break your bones, but words will get you suspended. South is cracking down on cursing this year, to the tune of suspending students any time their, um, stuff hits the fan. Principal Brent Belveal, now one month into his first year at South Albany, said staff members told him shortly after he joined the administration that profanity was a campus concern. The new policy: Mention a potentially off-color word -- that one that rhymes with "witch," say -- and you'll probably get a warning. Stronger language means stronger measures. "If they drop an "F-bomb," which is one people really get offended by, that's going to be a suspension," Belveal said. Belveal met with each class in the first few weeks of school to outline the enforcement policy. Part of South Albany's job is to train students for future job situations, he said, and most employers don't tolerate foul language. I suggest that next year's Modiin Christmas carols be sung in front of this Lee Cooper store. Note to all the Modiin residents who braved the email attacks, and tried to unsuccessfully explain why foul language doesn't belong in a mall ad campaign: you have my sincerest sympathies. Update: 10:22 PM 3 demonstrators arrested in Tel-Aviv's protest tonight; 1 for possessing a dagger, 1 for attacking a policeman, and 1 for waving a Palestinian flag. 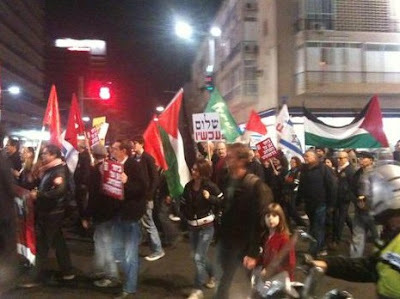 In probably the biggest Leftist demonstration in recent history (that didn't require a free concert), thousands have swarmed into Tel-Aviv to protest "anti-democratic trends in the Knesset". The "anti-democratic trends in the Knesset" they are referring to is a newly passed bill requiring a Knesset committee to investigate the sources of funding for 16 leftist organizations in Israel that have been at the forefront of de-legitimizing the IDF and Israel. The rather poorly kept secret is that Foreign Governments are behind much of the funding for these organizations that contribute to anti-IDF and anti-Israel activity. And while it's been known for a while that European governments are funding some of these groups, Im Tirtzu recently exposed that Arab countries are also funneling money to some of these Israeli NGOs. The reasons these organizations are so terrified of this investigation is three-fold: not only the possible loss of the bulk of their funding, but it would prove to the average Israeli that these organizations aren't "grassroots", but are simply foreign funded organizations who have Israel's worst interests at heart, and third, it will be near impossible for the organizations to continue to attack Israel in the international media based on the claim that they are actually native Israeli organizations. Could the bulk of the these organizations even continue to operate and exist if they had to rely on Israeli/Jewish funding only? In a brilliant tactical move this evening, PM Netanyahu announced that the Knesset would also investigate the funding sources of right-wing organizations. - organizations in favor of promoting "freedom of religion and equality of prayer for Jews on the Temple Mount"
Is there even one country in the world that is helping "Civil Rights for the Residents of Judea and Samaria" organization or perhaps, Honeinu, the legal rights fund for residents of Judea and Samaria? Somehow, I don't think foreign governments are behind them... and the above organizations are a thousand times more "grassroots" than any of those demonstrators in Tel-Aviv this evening. In the US, there is a law called FARA. The Foreign Agents Registration Act (FARA) was enacted in 1938. FARA is a disclosure statute that requires persons acting as agents of foreign principals in a political or quasi-political capacity to make periodic public disclosure of their relationship with the foreign principal, as well as activities, receipts and disbursements in support of those activities. Disclosure of the required information facilitates evaluation by the government and the American people of the statements and activities of such persons in light of their function as foreign agents. The FARA Registration Unit of the Counterespionage Section (CES) in the National Security Division (NSD) is responsible for the administration and enforcement of the Act. Yet, no one is calling the US anti-democratic. I would add, this new Israeli law does not impede the actions or activities of these NGOs. It merely exposes them as the foreign agents they are. It's no surprise that the "New" Israel Fund is leading tonight's demonstration. Gordon Gecko once said "Greed, for lack of a better word, is good." With the massive oil findings this past year, Israel is debating that concept... sort of. Greed is bad, if the investor, the one who took the risk, is the one who gets super-rich - according to some in our country. But it's not greedy to change the rules and thus take much higher tax revenues then what was originally promised to those oil search firms. But this post isn't about that debate, as important as it is. This post is about Lebanon. Greedy Lebanon. Lebanon has been making moves lately to try to grab Israel's oil fields away and claim them for themselves. 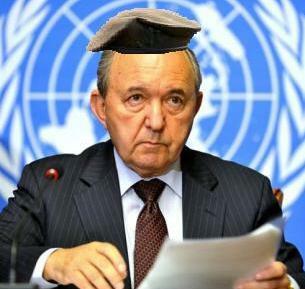 Lebanon has run all the way to the UN to get that ball rolling. While originally, and officially the UN originally said they weren't getting involved. Now it seems that they might be. Lebanon is claiming that Israel's gas is located off their coast and belongs to them. So I decided to clarify a few concepts for the readers before the discussion really gets out of hand. There are various types of maritime borders. For our purpose, we will be discussing the area called the "Exclusive Economic Zone" or the EEZ. The exclusive economic zone is an area beyond and adjacent to the territorial sea, subject to the specific legal regime established in this Part, under which the rights and jurisdiction of the coastal State and the rights and freedoms of other States are governed by the relevant provisions of this Convention. 160 countries have signed and ratified this treaty. Israel has not signed or ratified it. The US signed, but did not ratify it. Lebanon has both signed and ratified it. What the EEZ does is define the maritime borders and economic exploitation rights of each country within their EEZ. There are a few countries with clear disputes based on overlapping claims (or in some cases, overreaching claims). Israel should not be one of them. While not a signatory, Israel's neighbors, Cyprus, Lebanon and Egypt are. The EEZ borders of each country are relatively clear, and (until now) undisputed because it's not such a technically difficult region to demarcate (thought the demarcation process is a very technical one). and even though Lebanon never formally demarcated/declared their EEZ. Furthermore, until now, Israel has been claiming this specific region also by right of the Continental Shelf, which doesn't even require the UNCLOS treaty for demarcation. 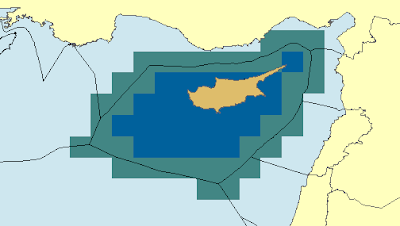 To further bolster Israel's claim, Israel and (Greek) Cyprus recently reconfirmed their EEZ border demarcations after Israel's gas find, confirming that Cyprus has no claim to that region. Turkey was very upset by this, even though North Cyprus's EEZ is only connected to Lebanon, not Israel. In the map below you can see where Israel's EEZ is, and the location of the dig sites within the EEZ. The cream colored areas are the exploration rights zones, not the size of the gas fields. (I apologize for the 1967 armistice line markings on the map). Questions might arise if the underground gas reserves actually straddle the border of a neighboring EEZ, but they don't. But that hasn't stopped Lebanon has claimed it is possible the basin extends to Lebanese waters. 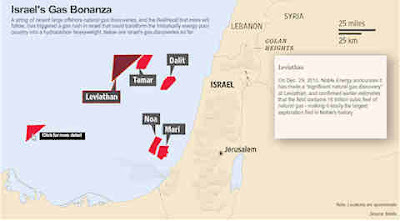 Delek Drilling, one of the partners in the U.S.-Israeli consortium, denied this: "An examination made with the Petroleum Commissioner showed that these claims are not correct and the location of the license where Tamar 1 is being drilled was studied carefully and it was found that the entire area of the license was within territorial waters of the state of Israel." 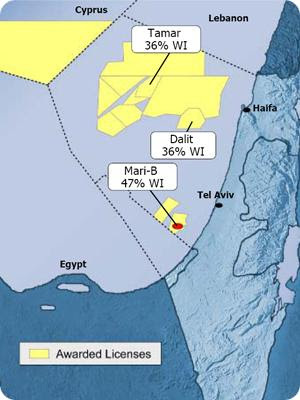 Delek Group chairman Gabi Last added, "The border of Israel's exclusive economic zone waters passes to the north of the Tamar oil drilling, and significantly so." But the truth won't stop Lebanon from creating a false narrative. Unfortunately, since this is the UN we are talking about, we can now expect yet another international attack on Israel's basic rights. Lebanon is greedy. Lebanon knows it can probably count on the UN to attack Israel in the arena, and perhaps even win. But as I said at the beginning "Greed is good". Israel might actually fight this one to win. 9:00 AM News report on Galei Tzahal has identified 2 of the 20 companies that have chosen to boycott their fellow countrymen and deny Israeli sovereignty over Jerusalem and the Golan, in exchange for cash from the Palestinian Authority for working on the Arab town of Rawabi. Ytong denies they signed the contract with the anti-Zionist/anti-Semitic/Apartheid clause in it, but they are working in Rawabi (either directly or through contractors). More information, clarifications, and companies will be listed as information becomes available. Teldor has a factory in the Golan. Knesset Economics Committee meeting this morning to discuss companies who signed boycott. US Representative Shot...Fighting for her life. The US Congresswoman Gabrielle Giffords from the State of Arizona was battling for her life on Sunday after an assailant shot her in the head and killed six others as she met with constituents in Tucson. Reuters: The 40-year-old Democratic lawmaker was in critical condition and doctors were cautiously optimistic she would survive. The suspected gunman was in federal custody as investigators sought a motive in the rare shooting of a U.S. lawmaker and looked for a possible accomplice. The suspect, identified as Jared Lee Loughner, 22, opened fire with a semi-automatic pistol at point-blank range outside a supermarket on Saturday afternoon. He was tackled by two bystanders after the shooting. Among the dead were a federal judge and a 9-year-old girl. Twelve other people were wounded in the shooting rampage. 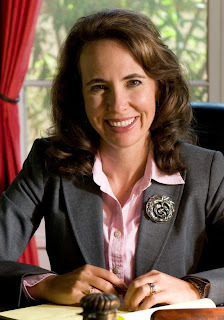 She is a vocal advocate for renewable energy, particularly solar energy, and has said improving security along the U.S.-Mexico border is among her top priorities. She is also a supporter of Israel, and is considered a safe pro-Israel vote in the House. Wishing her a speedy, and full recovery. Caliber-3 with top Israeli Anti-Terror Experts! I believe the ad is real, and there a few people I can think of off-hand, whom I can imagine being the author. This ad disturbed me all Shabbat long. So there’s no real great way to write this so I’ll just start plainly and the following. I’ve just turned 40 and I’m a Jewish Orthodox woman. I’m warm, fun and loving and very committed to Judaism and to Zionism. I’m told that I’m pretty and I choose to believe that;-) I don’t want to give out too much information but I’ve got some really great and cool family members. Bottom line is I’m not married and I really would like to have children and BH still can – I was recently tested. So here’s the story, I’m looking for a partner to become a joint-parent with me. If you are frum (I assume you know what this means..) and doven and are a Zionist. If you’ve got a stable job and are normal (by my standards.. which are pretty lenient..) then please feel free to contact me at singlefrummom2b@gmail.com . Of course we’d have to meet and discuss details as to where to live, send kids to school, mutual visitation rights etc.. and everything would have to be written and signed in a contract. But think about it – you get to have kids with a wonderful Mom and you’re free!! Sounds like a good deal to me. If you’re interested, drop me a note. I want to make it very clear that I am not criticizing the girl lady in the least bit in this post. I understand her and how she got there. But what does this say about what is happening in the single community? Here is a girl lady who desperately wants to have children while she still can. Based on what she's written, I don't believe she is afraid to get married. At this point she may not even be too picky about the guy she is willing to marry. She is clearly willing to take on the commitment of raising a child. But what is her big selling point to the prospective father? She believes (probably rightfully so) that the guys that she is dating are afraid to commit to marriage (or even to a long-term relationship), and that is why she has reached this state. I believe she's mostly right. I do have a problem believing that she will actually find someone normal who wants a child, but is afraid to commit to getting married. Perhaps she is hoping to break the commitment phobia, by easing the guy into a comfortable relationship over time, and when he reaches the point that he realizes he is actually in a relationship, by then he will be comfortable with it and be willing to take the step to marriage. I don't know. I see heartbreak ahead if that's the case. But that might not even be what's on her mind. She may really believe that this is the only option left on the table. As it is, even as popular as divorce is today, I can see the child having a tough time in this situation. One theory I have is that guys don't want to, and often can't commit because in their mind, there's always someone newer or better around the corner (or because the girl lady is not exactly what they are looking for physically). Meanwhile the girls ladies don't know how to get the guys to stay involved long enough to build a relationship, and subsequently convince the guys to take the next step. (And occassionally, because there is something just not perfect about the guy they are dating). I think both sides need some lessons in what a relationship really is and what marriage really is. Getting back to this girl lady, a lot of thoughts ran through my head while reading this. I have no conclusions to make, or advice to give. I was just saddened that someone had to reach that state at all. I'm sending her an email to comment here, if she is willing. Perhaps it will help her find not just a partner, but a husband too. Disney Theme Park Coming to Israel!